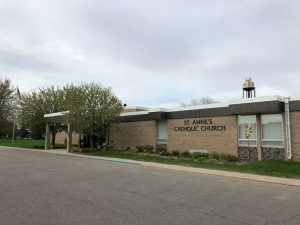 The present parish in this village located in the southern part of Stearns County is the successor of a previous parish in the same area which was called St. Anna and existed from 1873 until a cyclone destroyed the church on June 27, 1884. The small log church was built a mile and a half east of Watkins on an acre of land donated by John and Elizabeth Becker. In 1888 the congregation consisted of 40 families. After the cyclone the church was not re-built and the Catholic families attended religious services in neighboring Watkins and Pearl Lake. In the summer of 1919 several Catholic families in Kimball, under the leadership of Miss Kate Berscheid, began exploring the possibility of a parish in the village. On October 12 the same year Bishop Busch met with the group in the village hall and gave his approval to the establishment of a parish. Among the families represented at the meeting were those of William French, the mayor, Claude Brower, the banker, Fred Brower, owner of the hardware store, Gerhard Looman, who later donated land for the cemetery, Joseph Borman, Anton Tellers, William Looman, George Nothnagel, Aloys Ertle, Jacob Cooper, Steve Beckman, John Stelton, Henry Steman, M.E. Eichers, John Stein, Carl Engler, Vincent Berscheid, Oscar Nystrom, and M. E. Eichers. Following the meeting Father John Brender, pastor of Luxemburg, came to Kimball every Sunday and offered Mass in the village hall. By the following year the parishioners had built a basement church and the first Mass offered in it was the funeral Mass of Mrs. Carl Hunt on December 12. Father Edward Mahowald was in charge of organizing the parish which was incorporated on September 13, 1920, with himself listed as pastor and Paul Berscheid and Aloys Knaus as trustees. The parish property was purchased for $2,500 and the basement church was built at a cost of $2,200. A house was purchased for $5,700 and converted into a rectory to be used by the first resident pastor, Father Matt Butala (1921-25). The parish continued to grow during the years of Father Paul Kunkel (1925-31), but because of the Great Depression it became a mission of Paynesville for three years. The decade of the 1930’s were difficult years economically and little material progress was made in the parish, although the spiritual life of the parishioners was intensified. The economy improved both nationally and locally during the Second World War so that with the coming of Father Sylvester Renner (1947-49) and Father Raymond Lang (1949-53) the parish was able to make strides materially. In 1948 a social hall was built behind the basement church. As the parish increased in numbers an opening was made through the wall of the social hall to accommodate the increasing numbers at the services. During these years the parish also established a building fund to meet the future needs. In 1953 property for a new church-school complex was purchased at a cost of $8,000. On May 26, 1964, ground was broken for the construction of the new $303,773 edifice. A pioneer member of the parish, Alois Ertl, turned the first shovel in the ceremony. The first service in the new church was the funeral of the paster, Father Raymond Jacques (1953-64), under whose direction the project was undertaken. In May, 1965, Bishop Bartholome dedicated the new church and school. In 1977 the parish established a fund for the purpose of renovating the gymnasium into a permanent church. The $146,964 project was undertaken in 1979 and completed by Christmas that year. The completely renovated church was dedicated by Bishop Speltz in 1980. The rectory was renovated in 1982 at a cost of $15,000. Since its beginning in 1919 the parish has been served by 18 pastors with Fathers Nicholas Kraemer (1936-47) and Raymond Jacques (1953-64) serving the longest terms. For more than 30 years Elizabeth Nystrom served as organist and choir director. In 1978 four members of the parish received the Bishop’s Medal of Merit: Lee Robinson, Lorraine Dingmann, Mary Maus, and Milford Zohlek. One son of the parish, Donald Wagner, has been ordained to the priesthood and two sons to the deaconate: Steve Yanisch and Kenneth Bates. Three daughters of the parish have entered the religious life: Sister Cyprian (Rita) Kunkel, O.S.B., Sister Francetta (Betty) Kunkel, S.Sp.S. and Sister Mary Paula Unterberger, S.S.N.D.